I always loved when my Mom would decorate for holidays when we were kids. It was always so magical to me to see our home transform to reflect the upcoming holiday! I don’t have a lot of extra time to create festive crafts from scratch, which is why I love The Wood Connection! The Wood Connection has a huge variety of unfinished wood crafts that you can complete any way you like! In other words, I still get to feel really crafty without having to do a lot of work. 😉 They are based out of Utah, but ship most of their items! Awesome, right?! I can never leave The Wood Connection without huge bags of fun crafts to make. My kids love picking out items to paint and finish at home, too. I knew I needed to make this cute stacking luck decoration as soon as I saw it! 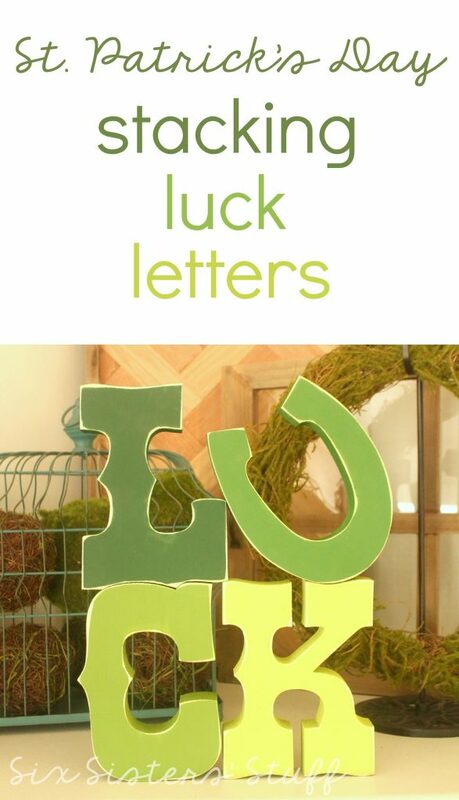 The stacking luck kit comes with the unfinished letters that you can stack or stand next to each other horizontally. The letters can stand on their own and are 8″ tall. I like to keep things pretty simple, and loved the idea of painting each letter a different shade of green! Paint each letter with two coats of paint, one of each color. I painted the “L” in Green Isle, the “U” in Kelly Green, the “C” in Leaf Green and the “K” in Apple Green. Let paint dry completely. Sand the edges of the letters with fine grit sandpaper and you’re done! Super easy and so cute! We are also giving away a $25 gift certificate to The Wood Connection, so you can make it yourself! I love this! Thanks for sharing the link to The Wood Connection! I never saw their site before!